For other uses, see Rector. A rector ("ruler", from rector meaning "ruler") is a senior official in an educational institution, and can refer to an official in either a university or a secondary school. Outside the English-speaking world the rector is often the most senior official in a university, whilst in the United States the most senior official is often referred to as President and in the United Kingdom and Commonwealth of Nations the most senior official is the Chancellor, whose office is primarily ceremonial and titular. The term and office of a rector can be referred to as a rectorate. The title is used widely in universities in Europe. [Notes 1] and is very common in Latin American countries. [Notes 2] It is also used in Brunei, Turkey, Russia, Pakistan, the Philippines, Indonesia, Israel and the Middle East. In the ancient universities of Scotland the office is sometimes referred to as Lord Rector, is the third most senior official, and is usually responsible for chairing the University Court. The head of a university in Germany is called a president, rector magnificus (men) or rectrix magnifica (women), as in some Belgian universities. In Dutch universities, the rector magnificus is the most publicly prominent member of the board, responsible for the scientific agenda of the university. In the Netherlands, the rector is, however, not the chair of the university board. The chair has, in practice, the most influence over the management of the University. In some countries, including Germany, the position of head teacher in secondary schools is also designated as rector. In the Netherlands, the terms "rector" and "conrector" (assistant head) are used commonly for high school directors. This is also the case in some Maltese secondary schools. In the Scandinavian countries, the head of a university or a gymnasium (higher secondary schools) is called a rektor. In Sweden and Norway, this term is also used for the heads of primary schools. In Finland, the head of a primary school or secondary schools is called a rector (rehtori) provided the school is of sufficient size in terms of faculty and students, otherwise the title is headmaster (koulunjohtaja). The head of some Finnish universities is called chancellor ("kansleri"). In the Iberian Peninsula, Portugal's and Spain's university heads or presidents have the title . Those universities whose foundation has been historically approved by the Pope, as e.g. the rector of the University of Coimbra, the oldest Portuguese university, is referred to as Magnífico Reitor (Rector's name) ("Rector Magnificus (Rector's Name)"). The others are referred to as Excelentíssimo Senhor Reitor. In Spain, all Rectors must be addressed as Señor Rector Magnífico according to the law (Ley Orgánica 4/2007), but the Rector of the University of Salamanca, the oldest on the Iberian Peninsula, is usually styled according to academic protocol as Excelentísimo y Ilustrísimo Señor Profesor Doctor Don (Rector's name), Rector Magnífico de la Universidad de Salamanca ("The Most Excellent and Most Illustrious Lord Professor Doctor Don (Rector's name), Rector Magnificus of the University of Salamanca"). In a few "Crown lands" of the Austrian Empire, one seat in the Landtag (regional legislature of semi-feudal type) was reserved for the rector of the capital's university, notably: Graz in Steiermark (Styria), Innsbruck in Tirol, Wien (Vienna) in Nieder-Österreich (Lower Austria); in Bohemia, two Rectors seated in the equivalent Landesvertretung. The heads of Czech universities are called the rektor. The rector acts in the name of the university and decides the university's affairs unless prohibited by law. The rector is nominated by the University Academic Senate and appointed by the President of the Czech Republic. The nomination must be agreed by a simple majority of all senators, while a dismissal must be agreed by at least three fifths of all senators. The vote to elect or repeal a rector is secret. The term of office is four years and a person may hold it for at most two consecutive terms. The rector appoints vice-rectors (pro-rektor), who act as deputies to the extent determined by the Rector. Rectors' salaries are determined directly by the Minister of Education. Among the most important rectors of Czech universities were reformer Jan Hus, physician Jan Jesenius and representative of Enlightenment Josef Vratislav Monse. Jiřina Popelová (Palacký University of Olomouc) became the first female Rector in 1950. The rectors are addressed "Your Magnificence Rector" ("Vaše Magnificence pane rektore"). In Danish, rektor is the title used in referring to the heads of universities, gymnasiums, schools of commerce and construction, etc. Generally rektor may be used for the head of any educational institution above the primary school level, where the head is commonly referred to as a 'skoleinspektør' (Headmaster; Inspector of the school). In universities, the second-ranked official of governance is known as prorektor. Most English universities are formally headed by "chancellors"; however, at University of Oxford and University of Cambridge, most colleges are headed by a "master" or a "principal" as the chief academic. In a few colleges, the equivalent person is called a "president", "provost", or "warden". At two Oxford colleges, Lincoln College and Exeter College, the head is called "rector". At Oxford and Cambridge, the university's overall head is called "chancellor", but this is chiefly a ceremonial position while the academic head of each university is the "vice-chancellor". At St Chad's College, one of the two so-called "recognised colleges" of the University of Durham, there is a "rector" as titular head (the Dean of Durham Cathedral ex officio) while the academic head is the "principal". The University of London has a chancellor (a ceremonial post) and a vice-chancellor (equivalent to a managing director). All colleges have a chief academic as head, using a variety of titles. At University College London, the head is the "provost"; at King's College London the head is the "principal"; at Imperial College London the head was until recently called the rector, until this was split into a provost and president; and the London School of Economics is headed by a "director". At most other universities in England, the chancellor is the ceremonial head whilst the vice-chancellor is the chief academic. The vice-chancellor of Liverpool Hope University, also takes the role of rector. Prior to their conversion to universities, polytechnics often had the rector as the head of the establishment; following their transition to universities, the rector became the vice-chancellor. The head of a German university is either called "Rektor" (rector) or "Präsident" (president). 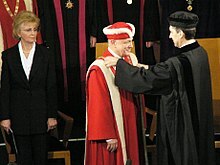 The difference is usually that a "Rektor" is elected by the Senate from among the professors of the university (which is the traditional method of choosing the head of a German university), while a "Präsident" need neither be a professor nor a member of the university (or of any university) prior to appointment. The "Rektor" is traditionally addressed as "Magnifizenz". The rektor is term used for the headmaster or headmistress of Icelandic universities and of some gymnasia. In Italy the rector is the head of the university and Rappresentante Legale (Legal representative) of the university. He or she is elected by an electoral body composed of all Professori ordinari ed associati (full and associate professors), the two highest ranks of the Italian university faculty, all the Ricercatori (lowest rank of departments) and representatives of the staff, students and PhD students. The term of a rettore is now six years, in accordance with the new national regulation and the statuto (constitution of the university). The Rettore is styled and formally greeted as Magnifico Rettore (Magnificent Rector). In the Netherlands, the rector is the principal of a high school. The rector is supported by conrectors (deputy rectors who can take his place). In Dutch universities, the Rector Magnificus is responsible for the scientific vision and quality of the university. The rector magnificus is one of the members of the executive board of a university. The rector magnificus is a full professor. The ceremonial responsibilities of the rector magnificus are to open the academic year, and to preside over the ceremonial PhD defenses and inaugural lectures of newly appointed (full) professors. During PhD defenses the rector is usually replaced by another full professor who is acting rector during the session. A rector (Norwegian: rektor), in the context of academia, is the democratically elected head of a university or university college. The rector is the highest official of the university, and is traditionally elected among the institution's professorship, originally by all the (full) professors and in modern times by all academic employees, the students and the non-academic employees. The rector is traditionally the head of the Collegium Academicum, which has been renamed the university board in the 2000s, and is also the university's chief executive and ceremonial head. The elected deputy of the rector is known as pro-rector (Norwegian: prorektor). Some institutions also have vice rectors, who are appointed by the rector and subordinate to the rector and pro-rector. All established universities have democratic elections for the rector and pro-rector positions, but some newer colleges or former colleges have abolished such elections. Universities and colleges usually have a university director or college director, who is the head of the administration (i.e., the non-academic employees) and subordinate to the rectorate. In Poland, the rector (Polish: rektor) is the elected head of a university or university college, in military, military type upper educaction institutions name of rector like official is (Polish: komendant) (commander). The rector is the highest official of the university. Rector of the university can be a person with at least a doctoral degree, employed by the university as the main place of work. Rector is referred to as Jego/Jej Magnificencja (en. His/Her Magnificence) (abbreviation: JM). The outfit of rector is red or purple coat (robe) with ermine fur, often with a scepter and a decorative string of symbols of the university. Deputy rectors (Polish: prorektor) at official ceremonies are dressed in the same gown, but with fewer decorations (usually without the fur). Rectors of military universities - wear only uniform of an officer and a necklace with symbols of the university. The term of office of the rector of public universities since 2008 lasts for 4 years (previously 3 years) and begins on 1 September in an election year and ends on 31 August of the year in which the term ends. A person may not be elected to serve as rector for more than two consecutive terms. In the case of private universities the rule is regulated by university statute. In Portugal, the rector (Portuguese: Reitor) is the highest official of each university. The title of the rector of the universities whose foundation has been historically approved by the Pope, as the University of Coimbra, the Univ. of Évora or, in modern times, the Catholic University, is called Magnífico Reitor (Magnificus Rector, as the rector was called in the Latin documents). Each university faculty is headed by a director or a president of the directorate council, and the rector heads all of them. Until 1974, the director of each Lyceum (high school) also had the title of Rector. In Russia, the rector (Russian: Ректор) as a term for a university chancellor introduced in 1961. Before 1961 university chancellor had title "director" (Russian:Директор). In Scotland, the position of rector exists in the four ancient universities (St Andrews, Glasgow, Aberdeen and Edinburgh) and at Dundee, which is considered to have "ancient" status as a result of its early connections to the University of St Andrews. The current office of Rector, sometimes termed Lord Rector, was instituted by the Universities (Scotland) Act 1858, passed by the Parliament of the United Kingdom. With the Universities (Scotland) Act 1889 requiring an election for the Rector every 3 years in the ancient universities. The rector is the third-ranking official of university governance and chairs meetings of the university court, the governing body of the university, and is elected every three years by matriculated students at Aberdeen, Dundee, Glasgow and St Andrews, and by the students and staff at Edinburgh. The titular head of an ancient university in Scotland is the Chancellor, who appoints a Vice-Chancellor to deputise in the awarding of degrees. The Principal of each university is, by convention, appointed as Vice-Chancellor, however the position of Vice-Chancellor does not confer any other powers or responsibility on the Principal. The authority to serve as chief executive of each university is vested in the office of Principal, who holds both offices referred to as Principal and Vice-Chancellor. The role of the rector is considered by many students[by whom?] to be integral to their ability to shape the universities' agenda, and one of the main functions of the rector is to represent the interests of the student body. To some extent the office of rector has evolved into more of a figurehead role, with a significant number of celebrities and personalities elected as rectors, such as Stephen Fry and Lorraine Kelly at Dundee, Clarissa Dickson Wright at Aberdeen, and John Cleese and Frank Muir at St. Andrews, and political figures, such as Mordechai Vanunu at Glasgow. In many cases, particularly with high-profile rectors, attendance at the university court in person is rare; the Rector nominates an individual (normally a member of the student body) with the title of Rector's Assessor, who sits as a voting member of the University Court. The Rt. Hon. Gordon Brown, the former Prime Minister of the United Kingdom, was Rector of the University of Edinburgh while a student there, but since then most universities have amended their procedures to disqualify currently matriculated students from standing for election. As of January 2018[update] the rector of the University of Aberdeen is Maggie Chapman, co-convenor of the Scottish Green Party. The rector of the University of Dundee is the long-distance cyclist Mark Beaumont. The rector of Edinburgh is Ann Henderson. The rector of the University of Glasgow is Aamer Anwar. The rector of the University of St Andrews is Srđa Popović the political activist. Some Scottish high school/secondary school have a head teacher whose official title is Rector, an example being Bell Baxter High School in Cupar, Fife. In Spain, Rector or Rector Magnífico (magnific rector, from Latin Rector Magnificus) is the highest administrative and educational office in a university, equivalent to that of president or chancellor of an English-speaking university, but holding all the powers of a vice-chancellor; they are thus the head of the academy in universities. Formally styled as "Excelentísimo e Ilustrísimo Señor Profesor Doctor Don N, Rector Magnífico de la Universidad de X" (Most Excellent and Illustrious Lord Professor Doctor Don N, Rector Magnificus of the University of X), it is an office of high dignity within Spanish society, usually being highly respected. It is not strange to see them appear in the media, especially when some academic-related subject is being discussed and their opinion is requested. Spanish rectors are chosen from within the body of university full professors (Catedráticos in Spanish); it is compulsory for anyone aspiring to become a rector to have been a doctor for at least six years before his election, and to have achieved professor status, holding it in the same university for which he is running. Usually, when running for the election the rector will need to have chosen the vice-rectors (vicerrectores in Spanish) who will occupy several sub-offices in the university. Rectors are elected directly by free and secret universal suffrage of all the members of the university, including students, lecturers, readers, researchers, and civil servants. However, the weight of the vote in each academic sector is different: the total student vote usually represents 20% of the whole, no matter how many students there are; the votes of the entire group made up of professors and readers (members of what used to be known as the Claustro (cloister)) usually count for about 40-50% of the total; lecturers, researchers (including Ph.D. students and others) and non-doctoral teachers, about 20% of the total; and the remainder (usually some 5-10%) is left for non-scholarly workers (people in administration, etc.) in the university. Spanish law allows those percentages to be changed according to the situation of each university, or even not to have a direct election system. Indeed, in a few universities the Rector is chosen indirectly; the members of the modern Claustro (a sort of electoral college or parliament in which all the above-mentioned groups are represented) is chosen first, and then the Claustro selects the Rector. Rectors hold their office for four years before another election is held, and there is no limit to the number of re-election terms. However, only the most charismatic and respected rectors have been able to hold their office for more than two or three terms. Of those, some have been notable Spanish scholars, such as Basque writer Miguel de Unamuno, Rector of the University of Salamanca from 1901 until 1936. Rektor is the title for the highest-ranked administrative and educational leader for an academic institution, such as a primary school, secondary school, private school, high school, college or university. The rektors of state-run colleges and universities are formally appointed by the government, i.e. the cabinet, but upon the advice of the concerned institution's board, and usually following some sort of democratic process at the concerned institution. The adjunct of a rektor at a university is called a prorektor and is appointed by the institution's board. In the older universities, Uppsala university and Lund university, the rektor is titled rector magnificus (men), or rectrix magnifica (women). Younger universities have in more recent years started using the Latin honorary title in formal situations, such as in honorary speeches or graduation ceremonies. The University Chancellor of Sweden was until 2017 the title of the head of the government accrediting agency, the National Agency for Higher Education. From 2017, this position carries the title Director General which is the usual title of the head of a government agency. The people recruited to the position have in later times always been former vice-chancellors (presidents) of a Swedish university. The position does not include leadership of a university. The heads of the universities in Switzerland, usually elected by the college of professors, are titled rector (Rektor, recteur). The rector is the head of most universities and other higher educational institutions in at least parts of Central and Eastern Europe, such as Bulgaria, Bosnia and Herzegovina, Croatia, Poland, Romania, Russia, North Macedonia, Serbia, Slovenia, Turkey, Hungary and Ukraine. The rector's deputies are known as "pro-rectors". Individual departments of a university (called faculties) are headed by deans. As in most Commonwealth and British-influenced countries, the term "rector" is not commonly used in Canada. Quebec's universities, both francophone (e.g., Université de Montréal) and anglophone (e.g., Concordia University), use the term (recteur or rectrice in French) to designate the head of the institution. In addition, the historically French-Catholic, and now bilingual, Saint Paul University in Ottawa, Ontario uses the term to denote its head. St. Paul's College, the Roman Catholic College of the University of Manitoba, uses the term 'rector' to designate the head of the College. St. Boniface College, the French College of the University of Manitoba, uses 'recteur' or 'rectrice' to designate the head of the College. At the bilingual University of Ottawa, the term president has been used since 2008, but before that time rector was used for the English name; however, recteur (or rectrice) continues to be used as the French term for the head of the university. Queen's University (Kingston, Ontario) uses the term "rector". The term refers to a member of the student body elected to work as an equal with the chancellor and principal. The Badge of Office of the Rector of Queen's University was registered with the Canadian Heraldic Authority on 15 October 2004. See List of Rectors of Queen's University. Most U.S. colleges use the titles "president" for the chief executive of the college and "chair of the board of trustees" for the head of the body that legally "owns" the college. The terms "president" and "chancellor" are used for the chief executive of some universities and university systems, depending on the institution's statutes (some state university systems have both presidents of constituent colleges and a chancellor of the overall system, or vice versa). Several notable exceptions exist in Virginia: the University of Virginia (Charlottesville), University of Mary Washington (Fredericksburg), George Mason University (Fairfax), Virginia State University (Petersburg), Virginia Commonwealth University (Richmond), Longwood University (Farmville), Washington and Lee University (Lexington), the College of William and Mary (Williamsburg), Old Dominion University (Norfolk), Christopher Newport University (Newport News), and Virginia Tech (Blacksburg) use the term "Rector" to designate the head of the Board of Visitors. The College of William and Mary also has a "Chancellor" who acts in a ceremonial capacity. As far as American high schools, one notable case is the Rector of St. Paul's School in New Hampshire, in which the Rector is equivalent to the Headmaster. In the University of California system, each of the ten campuses are headed by a chancellor, however the leader of the system is given the title "president". From 1701-1745, the head of the school that was to become Yale University was termed the "rector". As head of Yale College, Thomas Clap was both the last to be called "rector" (1740–1745) and the first to be referred to as president (1745–1766). Modern custom omits the use of the term "rector" and identifies Abraham Pierson as the first Yale president (1701–1707). Clap is construed to have been the fifth in the sequence of men who were Yale's leaders. Several Catholic colleges and universities, particularly those run by religious orders of priests (such as the Jesuits) used to employ the term "rector" to refer to the school's chief officer. In many cases, the rector was also the head of the community of priests assigned to the school, so the two posts – head of the university and local superior of the priests – were merged in the role of rector (See "Ecclesiastical rectors" below). This practice is no longer followed, as the details of the governance of most of these schools have changed. At the University of Notre Dame, the title "rector" is used for those in charge of individual residence halls. The term "rector" is uncommon in Australian academic institutions. The executive head of an Australian university has traditionally been given the British title Vice-Chancellor, although in recent times the American term President has also been adopted. The term rector is used by some academic institutions, such as the University of Melbourne residential college, Newman College; the private boys' school, Xavier College; and the University of Sydney residential college, St John's College (Benedictine). The title rector is sometimes used for the head of a subordinate and geographically separate campus of a university. For example, the executive head of the Australian Defence Force Academy in Canberra, which is a campus of the University of New South Wales in Sydney is a Rector, as is the head of the Cairns campus of James Cook University, based at Townsville. The title is used in New Zealand for the headmaster of some independent schools, such as Lindisfarne College and St. Patrick's College, Silverstream, as well as a number of state schools for boys, including Otago Boys' High School, King's High School, Dunedin, Waitaki Boys' High School, Timaru Boys' High School, Palmerston North Boys' High School and Southland Boys' High School showing the Scots' involvement in the foundation of those schools. In Mauritius the term 'rector' is used to designate the head of a secondary school. The heads of certain Indian boarding schools are called rectors. The head or principal of a Catholic school in India is also called a rector. During the years of the Tokugawa shogunate (1601–1868), the rector of Edo’s Confucian Academy, the Shōhei-kō (afterwards known at the Yushima Seidō), was known by the honorific title Daigaku-no kami which, in the context of the Tokugawa hierarchy, can effectively be translated as "Head of the State University". The rector of the Yushima Seidō stood at the apex of the country-wide educational and training system which was created and maintained with the personal involvement of successive shōguns. The position as rector of the Yushima Seidō became hereditary in the Hayashi family. The rectors' scholarly reputation was burnished by the publication in 1657 of the seven volumes of Survey of the Sovereigns of Japan (日本王代一覧, Nihon Ōdai Ichiran) and by the publication in 1670 of the 310 volumes of The Comprehensive History of Japan (本朝通鑑, Honchō-tsugan). In this Commonwealth nation, the term Rektor is used to refer to the highest administrative official in several universities and higher education institutions in Malaysia, such as the International Islamic University Malaysia in Gombak and the Universiti Teknologi MARA in Perak. A Rektor is comparable to the position of Naib Canselor, or vice-chancellor, in other higher education institutions, as the Rektor answers to the Canselor. The term rector (Burmese:ပါမောက်ခချုပ်) is used to refer to the highest official of universities in Myanmar. Each university department is headed by a professor, who is responsible to the rector. Nowadays, given the large dimensions of some universities, the position of pro-rector has emerged, just below that of the rector. Pro-rectors are in charge of managing particular areas of the university, such as research or undergraduate education. The heads of certain universities and colleges such as National University of Sciences and Technology, Ghulam Ishaq Khan Institute of Engineering Sciences and Technology, Forman Christian College, Virtual University of Pakistan, COMSATS Institute of Information Technology and PIEAS are all titled "Rector". The term rector or Rector Magnificus is used to refer to the highest official in prominent Catholic universities and colleges such as the University of Santo Tomás, the Colegio de San Juan de Letrán, and the San Beda University. The rector typically sits as chair of the university board of trustees. He exercises policy-making, general academic, managerial, and religious functions over all university academic and non-academic staff. During the Spanish colonial period, on 20 May 1865, a royal order from Queen Isabella II gave the Rector Magnificus of the University of Santo Tomas the power to direct and supervise all the educational institutions in the Philippines and thus, the Rector of the University became the ex officio head of the secondary and higher education in the Philippines. All diplomas issued by other schools were approved by the Rector of the University and examinations leading to the issuance of such diplomas were supervised by the professors of the University of Santo Tomas. The term rector is not widely used to refer to the highest executive position in Thai universities (Thai:อธิการบดี; RTGS: Athikan Bodi ), compared to the term president. Thammasat University adopts this term for this position to reflect its tradition associated with the French education system where Pridi Banomyong, Thammasat's founding father was educated. The term rector is used to refer to the highest official of universities, and university-owned high schools (e.g., Escuela Superior de Comercio Carlos Pellegrini) in Argentina. Each faculty (Spanish:Facultad) has its own dean. The term rector (Portuguese: Reitor) is used to refer to the highest official of universities in Brazil. Each faculty is headed by a director, who is under the authority of the rector. Nowadays, given the large size of some universities, the position of pro-rector has emerged below that of the rector. The pro-rector is in charge of managing a particular area of the university, such as research or undergraduate education. A rector who has resigned is often given the title rector emeritus. One who temporarily performs the functions usually fulfilled by a rector is styled a pro-rector (in parishes, administrator). ^ European nations where the word rector or words like it (rektor, recteur, etc.) is used in referring to university administrators include Albania, the Benelux, Bosnia and Herzegovina, Bulgaria, Croatia, Cyprus, Czech Republic, Denmark, Estonia, Finland, Germany, Greece, Hungary, Iceland, Italy, Latvia, Malta, Moldova, North Macedonia, Poland, Portugal, Romania, Russia, Scandinavia, Scotland, Serbia, Slovenia, Slovakia, Spain, Turkey and Ukraine. ^ "Rector" is used for university administrators in Latin American nations such as: Argentina, Bolivia, Brazil, Chile, Colombia, Paraguay, Puerto Rico, Cuba, Dominican Republic, Guatemala, Mexico, Peru and Venezuela. ^ "The Scottish University Rector. Introduction to the role of University Rector in Scotland" (PDF). 2007. Retrieved 13 December 2015. ^ a b UK Parliament. Universities (Scotland) Act 1858 as amended (see also enacted form), from legislation.gov.uk. ^ UK Parliament. Universities (Scotland) Act 1889 as amended (see also enacted form), from legislation.gov.uk. ^ "Standing Orders of the University Court | The University of Edinburgh". www.ed.ac.uk. University of Edinburgh. 12 May 2014. Retrieved 1 May 2017. ^ "The Scottish University Rector - Introduction to the role of University Rector in Scotland" (PDF). www.abdn.ac.uk. Scottish Rectors’ Group. 2007. Retrieved 30 April 2017. ^ "University of St Andrews: The Principal and Vice-Chancellor". University of St Andrews. ^ "Rector's Assessor". www.yourunion.net. University of St Andrews Students' Association. Retrieved 30 April 2017. ^ "Election of Gordon Brown as Rector, 1972 - Our History". ourhistory.is.ed.ac.uk. University of Edinburgh. Retrieved 1 May 2017. ^ "Dundee University names new rector". BBC News. 2016. Retrieved 2018-01-01. ^ "Ann Henderson confirmed as Rector". The University of Edinburgh. Retrieved 1 March 2018. ^ "Aamer Anwar elected as new Glasgow University rector". BBC News. 21 March 2017. ^ Miller, Rachael (2017-10-18). "Serb activist elected St Andrews rector". BBC News. Retrieved 2018-01-01. ^ "Contacts | Bell-Baxter High School". www.bbhs-online.co.uk. Bell-Baxter High School. Retrieved 1 May 2017. ^ Ponsonby-Fane, Richard A.B. (1956). Kyoto: the Old Capital, 794-1869. p. 418. ^ Brownlee, John S. (1999). Japanese Historians and the National Myths, 1600-1945: The Age of the Gods and Emperor Jinmu, p. 218 n14; N.b., Brownlee misidentifies Nihon Ōdai Ichiran publication date as 1663 rather than 1657. ^ Brownlee, John. (1991). Political Thought in Japanese Historical Writing: From Kojiki (712) to Tokushi Yoron (1712), p. 120. Herbermann, Charles, ed. (1913). "Rector" . Catholic Encyclopedia. New York: Robert Appleton Company. Chisholm, Hugh, ed. (1911). "Rector" . Encyclopædia Britannica (11th ed.). Cambridge University Press.